TriMet needs the public’s help in tracking down a person who assaulted a bus operator on Mon., April 4, 2016. We’re offering a $1,000 reward for information that leads to the arrest and conviction of the person responsible. The assault occurred on a Line 71 bus at SE 122nd and Powell on Monday, April 4 shortly before 6 a.m. The operator was struck in the face over a fare dispute. The operator was transported to a local hospital but fortunately the operator was not seriously hurt. Transit Police is investigating. They are looking for several persons of interest in the case. TriMet has coordinated with Transit Police and Portland Police for the release of photos taken from TriMet video of those persons of interest. TriMet and our Transit Police are committed to hold anyone that hurts an operator accountable. 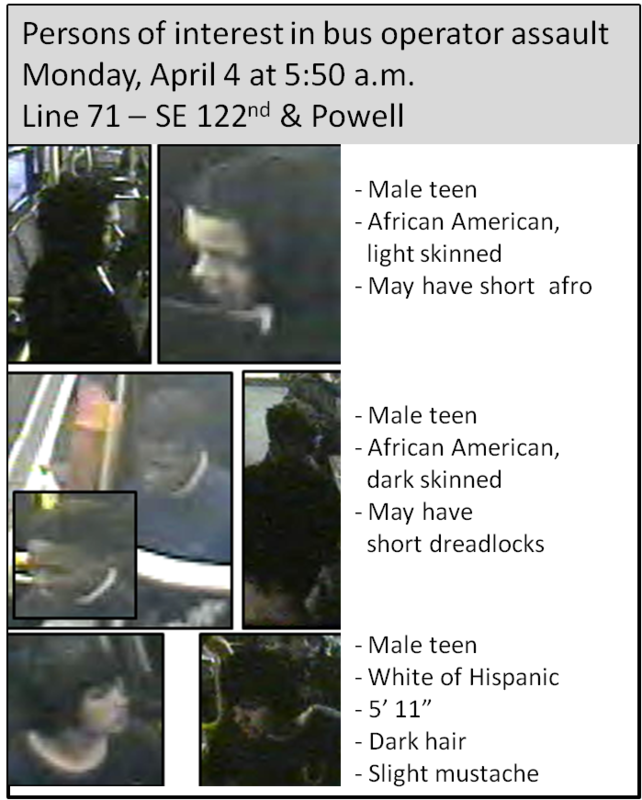 Anyone with information about the assault or the persons of interest should call Transit Police at 503-962-7566. The operator involved in this incident asks the media to please respect their privacy. Our operators have a tough job. They provide a vital service ever day, getting people where they need to go safely. While we have few incidents of this kind on the system, one is too many. We ask riders and the public to treat our operators with common courtesy.